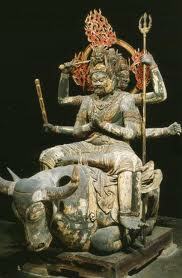 Buddhism arrived in Japan in the mid-6th century, carrying in its new form of belief a vast pantheon of deities. Originating in India and passing through China and the Korean peninsula, the Buddhist faith underwent various transformations while keeping the one, ultimate goal: attainment of nirvana or salvation and escape from the endless cycle of rebirth. Through contact with various Asian cultures where Buddhism was adopted, the Buddhist pantheon increased by the assimilation of Hindu deities, Chinese Daoist and Confucian beliefs, indigenous saints as well as Japanese Shinto deities (kami). The visual arts have become an important medium to transmit and teach Buddhist doctrine and the diversity and extent of the pantheon confronts people with a maze of Buddhist imagery. The exhibition Wrathful Deities and Compassionate Bodhisattvas: Aides of the Buddhist Faith leads through this maze of Buddhist deities, explaining their purpose and giving the visitor insight into the different iconographical renderings. In a system recalling Christian belief of the Holy Helpers and other saints, Buddhism also knows benevolent, merciful deities that assist the adherents in their faith. But besides the compassionate form of Buddhist bodhisattvas there are fierce-looking deities guarding the doctrine, the Myōō, or Wisdom Kings. The contrast between the merciful bodhisattvas and the almost demon-like ferocious deities is one of the most intriguing aspects in Buddhist art and these deities could be confused due to their gruesome outer appearance with mischievous devils and demons. The Clark Center's spring exhibition will showcase the diverse forms of aid through exquisite Buddhist sculptures and a rare bronze votive plaque (kakebotoke), ranging in dates from the 12th to the 14th century. Also featured are sophisticated Buddhist hanging scrolls dated from the same period, as well as intriguingly painted saints and deities created during the 17th to the 19th century. Amongst them is an abbreviated drawing (shukuzu) of a Buddhist narrative by the accomplished and widely known painter Kanō Tan'yū (1602–1674). Continuing to today, Buddha’s death is celebrated on February 15th as "Nirvana Day" and, in timely appropriation, a monumental nirvana painting (nehan-zu) of 9 × 6 feet (2.8 × 1.9 meters) dated to 1682, illustrating the death of the historical Buddha and his entrance into nirvana, is a highlight of this exhibition. Located on the mountain range Daiitokusan 大威徳山 between 白岩村 Shiraiwamura and Kakunodate. The highest mountain is about 178 m.
there were a lot of salmon in the river 玉川 Tamagawa and many fisherman tried their luck on a riverbank just below the shrine, dedicated to the 大威徳明王に Daiitoku Myo-O Deity. Almost every day there was a young monk of high stature in red robes, coming to observe the fishermen. He never accepted any fish offerings and just smiled. They begun to make fun of him, and then one day they bound a flask of sake and some fish on his back with a rope of acebia vine and sent him off home. From that day on, the salmon did not come up to this river any more. The child in red robes was an incarnation of the deity Daiitoku Myo-O. The fishermen wanted to grill some salmon for their lunch and went around to gather some branches for a fire. At that moment the young monk in red robes took away their sake flast and salmon, bound it on his back with acebia vine and run away. People come to this shrine when they have a stomach ace and pray for healing. They are then not allowed to eat salmon and acebia vine.
. Sake Legends and Shinto Shrines　酒と神社 . 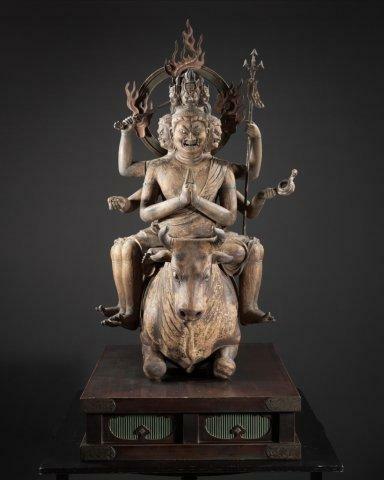 Six faces; six legs; six arms holding various weapons; riding a white cow (cow is symbol of enlightenment); has power to suppress evil and create goodness; also fights pain and poisons. Guardian deity for Amida Nyorai in the Western Pure Land; power to vanquish poisonous snakes and dragons; worshiped as a deity of victory; Museum of Fine Arts (Boston) has statue of Daitoku from the 10th century. Der Große Zerstörer in der Schlacht; tötet den Sturm-Drachen. Auch "Höllenfürst" (Kooenma) genannt; ursprünglich verwandt mit dem Höllenfürsten Emmaten bzw. in Abwandlung der japanischen Umschreibung für yamaantaka: Enmatokuka. yamaantaka bedeutet eigentlich "Der dem Todesgott Yama ein Ende macht". Furchterregende Inkarnation des Muryooju Nyorai, des Amida Nyorai bzw. des Monju Bosatsu. Leitet in allen sechs Existenzbereichen, siehe Sechs Jizoo. Besänftigt die Rachegeister der Verstorbenen (onryoo), gewährt Sieg im Kampf und fördert die Trennung einer unguten Liebesbeziehung. Weitherhin hilft er bei Epidemien, Dürrekatastrophen und Überschwemmungen. Im Westen bei fünf Figuren. Grünschwarze Körperfarbe. Drei große und darüber drei kleine Köpfe, insgesamt also sechs Köpfe; sechs Arme und sechs Beine. Der einzige Myo-O mit sechs Beinen, daher auch "Ehrwürdige Gottheit mit sechs Beinen" (rokusoku son) genannt. In jedem Gesicht drei Augen. In den rechten Händen: Schwert, Stab der Lehre. In den linken Händen: Dreizack mit langem Stab und Drachen-Seil. Die mittleren Hände vor der Brust gefaltet, mit ausgestreckten Zeigefingern. Die Zeigefinger durchstoßen die Dunkelheit und das Unwissen und führen zur Klarheit. Reitet auf einem grünen Wasserbüffel, manchmal umgeben von Mäusen. Der Wasserbüffel wird selten stehend, häufiger liegend dargestellt.
. Buddhastatuen ... Who is Who .
. Museums, Collections, Exhibitions .